Turbo mode reduces page-loading time. It is activated when your browser internet connection is slow. Thanks to Turbo mode, you can quickly load pages and save money using a USB modem or in places with public Wi-Fi. This is especially important while roaming or when you are reaching your data limit on your plan. In Turbo mode, all page content, including videos, is sent to Yandex servers to be compressed and then sent to the browser on the user's computer. Restriction. In Turbo mode, only webpage data that you open in the browser ends up on Yandex servers. Personal data entered during e-payments and in authorization forms does not end up on Yandex servers since Turbo mode does not apply to pages that are protected using the HTTPS protocol. When Turbo mode is activated, the Turbo icon appears in the right part of the SmartBox. 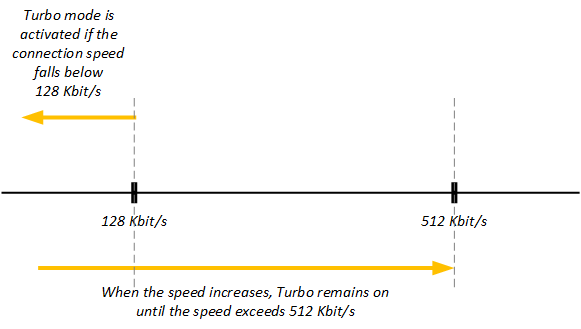 Turbo mode is enabled when connection speed falls below 128 Kbit/s, and remains on until the speed exceeds 512 Kbit/s. When the connection speed exceeds 512 Kbit/s, Turbo automatically switches off (and the icon in the SmartBox disappears). Turbo mode remains off until the speed falls below 128 Kbit/s. Restriction. You can't adjust the speed thresholds for switching Turbo mode on and off. When Turbo mode is enabled, certain page elements (such as video ads from other sites) might not load. A placeholder appears in their place with the message “Some page content has been hidden to reduce loading times”. To load the hidden content, click the placeholder. In the Turbo section, turn off the Compress video option. If you don't want Turbo mode to turn on/off automatically (in response to your connection speed), you can control it manually. That way it will stay on or off until you restart your browser. If you want Turbo mode to remain on/off even after you restart your browser, change your settings. Set the Turbo mode option to On. On the right side of the SmartBox, click the Turbo icon . Set the Turbo mode option to Off. You can manually turn Turbo mode on or off in your settings (which will also prevent it from turning on automatically). Additionally, you can disable video compression and turn off speed notifications. All settings are saved even after you restart your browser. In the Turbo section, set Turbo mode options. 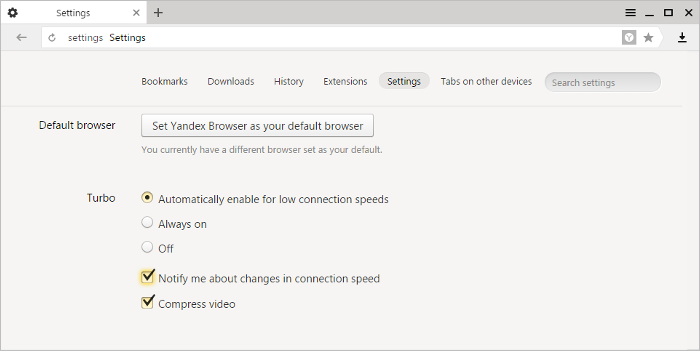 Automatically enable for low connection speeds This is how Yandex Browser works by default. Turbo mode automatically turns on when the connection speed is low and turns off when it's fast. Always on Turbo mode is always on, and the icon is displayed in the right part of the page header. For a fast internet connection, Turbo mode might slow down page loading. Off Turbo mode is disabled. When the internet connection is slow, the icon is displayed in the right part of the page header (enabling Turbo mode is recommended). Notify me about changes in connection speed You will get messages from Yandex Browser about changes in connection speed and the status of Turbo mode. Compress video Video compression is enabled by default in Turbo mode. You can disable video compression to improve video quality.